What Was the Military Food Stamp Program? The family subsistence supplemental allowance (FSSA) was designed to help military families who were on the Supplemental Nutrition Assistance Program, or SNAP, commonly known as food stamps. The FSSA program was discontinued in 2016. A survey conducted in 1999 showed that about 6,300 military families were on food stamps. That was a dramatic drop from the 12,000 who received aid in 1995 and represents less than 1 percent of the 1.4 million men and women in uniform. But according to Census data, about 23,000 active duty service members received food stamps in 2013. As of 2015, nearly half of children in Department of Defense Education Activity schools were eligible for free or reduced-price meals. Many military families, especially those with children, have a real need for extra assistance. 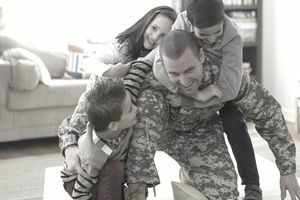 Some perceived the FSSA program as a way for the military to mask the fact that so many military families were in need of extra benefits. Families on food stamps who qualified for FSSA received a monthly cash allowance equal to their food stamp amount. Those not on food stamps received the amount of money required to bring their income to 130 percent of the federal poverty level. Qualification was based on the (U.S. Department of Agriculture's) gross monthly income eligibility limits based on household size. Also included in determining income eligibility were a basic allowance for subsistence or cash equivalents for those living in government housing, and all bonuses, special and incentive pays. The overseas cost-of-living allowance, stateside COLA, family separation housing allowance, clothing allowances, and all travel- and transportation-related allowances and entitlements were not to be included in gross income. Although people were permitted to collect the FSSA and food stamps at the same time, many people who were approved for FSSA received reduced amounts for food stamps, because the FSSA payments counted as income. The FSSA affected household participation in the subsidized school lunch program, the Women, Infant and Children program, income-based day care programs and earned income tax credit.